We have digital X-ray processing and ultrasound facilities. X-rays images are displayed on a laptop with high definition screen to allow clients to view the images taken. Ultrasound is useful for viewing such structures as the heart, bladder and liver and to assist in the diagnosis of problems. We have 9 purpose built hospitalisation units. 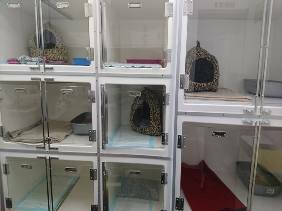 These vary in size and are adaptable to allow cats that are staying overnight or longer to have additional room compared to traditional veterinary kennels. Each unit is constructed of fibreglass for warmth compared to the usual stainless steel. The doors are glass for additional warmth and visibility and ease of cleaning. These also reduce cross infection through acting as a ‘sneeze barrier’. Where cats require intravenous infusions (drips) we use modern pumps which accurately control the rates of infusion – vital in cats to prevent the problems that can occur if given too much. 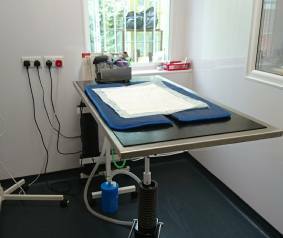 We use a combination of ‘VetBeds’, blankets, hot water bottles, absorption pads and litter trays to ensure patient comfort. In-patient care is provided by Carol and Louise, our fully qualified and RCVS registered veterinary nurses. 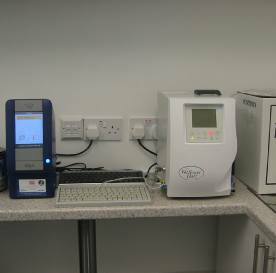 We have in-house analysis equipment which allows us to perform most routine blood and urine profiles within the hour. The Vet or Nurse will ring you with the results. For unusual profiles or pathology we use a commercial laboratory and courier service who are normally able to provide results in 24-48 hours. We do not ‘mark-up’ external laboratory fees – instead we charge the client the actual cost and an additional fee to cover sampling and interpretation of the results. We feel this is fairer and more transparent. Our operating theatre is equipped with the latest patient monitoring equipment which allows us to monitor the heart and other vital signs while a patient is anaesthetised for surgery. We use modern anaesthetics to help provide smooth recoveries and to minimise risks. Anaesthetic regimes are tailored according to the animal’s age and medical condition. We stock a range of feline products for sale including cat food, flea and worming treatments as well as a range of toys and accessories. Click here to view our range of products. 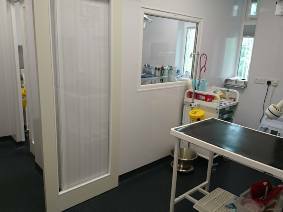 The nurse consulting room is used for undertaking minor procedures on your cat such as nail clipping and weighing as well as the application of worming and flea treatments. 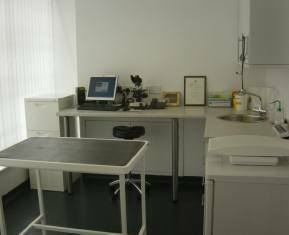 Consultations with the veterinary surgeon are undertaken in the main consulting room. 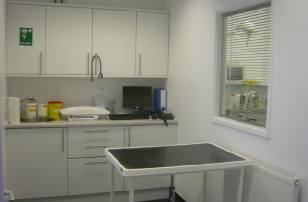 This room is equipped with an examination table and all equipment normally required for consultations. Your cat will be examined and any course of action discussed with you before being implemented. Our Standard appointments are 15 minutes long compared to 5-10 minutes at many vets. 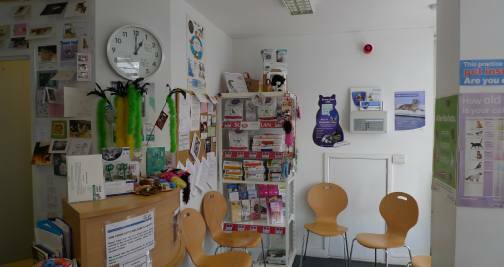 Our clinic offers a wide range of facilities to provide a high level of care for your cat.